Just exactly how tasty is that new coffee? “It’s great – I really like it”, says Respondent A. “I can taste the bean! It’s easily as good as many more expensive coffees!” exclaims Respondent B. Neither responses are particularly helpful. What you like might not be what I like. And isn’t tasting the bean the whole point? Alas, we know not how much bean taste has been lost between harvest and barista. And unless those more expensive coffees are named outright all we really hear is milk being frothed. Let’s try again. I usually drink Coffee X – how does this new coffee compare to that? “It’s not as bitter, perhaps a little richer”, says Respondent A. “It’s emphatically less acidic”, says Respondent B. Now we’re getting somewhere. 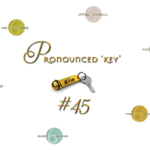 The key? Specifying a baseline. And if you’ve had exposure to that same baseline – Coffee X – you too might now have a better idea of how the new coffee tastes. And so it goes with audio gear. In asking “Just how good is the ELAC Uni-Fi U5?” we must also specify a baseline against which they can be compared. In the sub-US$2K standmount world, my baseline for the last five years has been KEF’s LS50. Chances are you’ve heard them too. 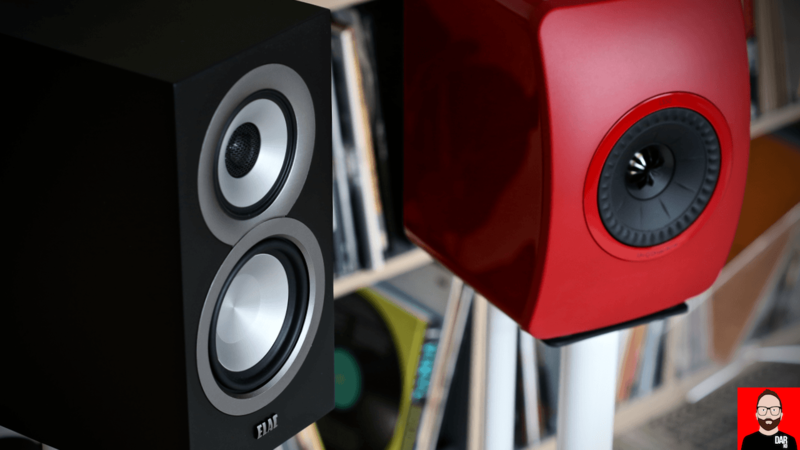 With both KEF and slimline ELAC present in the same listening room, the stage is easily set for a quick-fire standmount loudspeaker boxing match. This isn’t DAR’s usual speed. Ordinarily, several weeks of listening pile up the notes until they coalesce into a review proper. This would be different: a day of A/B listening, none too dissimilar that of the average high street store audition. Let’s skip the warm-up and get straight down to business. In the red corner, the incumbent, weighing in at 7.2kg and US$1500/pair, the glossy KEF LS50. In the black corner, our challenger: the Uni-Fi BS U5 Slim from ELAC that also tips the scales at a shade over 7kg but, get this, with a more lightweight wallet hit. At US$749/pair they sell for half the KEF’s asking. To restate the obvious: this would be a standmount standoff between the KEF and the ELAC only. The listening ring would be kitted out as follows: a full suite of electronics from PS Audio, including BHK Signature monoblocks and pre-amplifier, a DirectStream DAC w/ Roon Ready Network Bridge on digital duty and a NuWave Phono Converter fed by a Technics SL-1200G w/ Zu DL103R on vinyl. All but the monoblocks would be housed in a Hi-fi Racks’ Podium Slimline. The loudspeakers themselves would sit on a pair of white Atacama Nexus 6 stands, each filled with Atabites. Demo music? Complete albums from David Bowie, Prefab Sprout, The Field, Special Request, Shed, Pet Shop Boys and Conor Oberst, with several on hand in both digital and vinyl versions. Stepping into this ri(n)g, the ELAC have a one and half inch height advantage over the KEF. An extra half inch on box depth too. 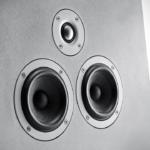 On front baffle width, the LS50 offer an extra inch of their own. In other words, the ELAC are taller, slimmer but at 17 litres, each loudspeaker model’s internal volume is effectively identical. This is where the physical similarities end. On aesthetics, especially dressed in Racing Red, the KEF ace it for this reviewer. The gloss black, rose-gold-drivered original aren’t too far behind. And were it not for ELAC revising the U5’s dimensions (taller, narrower) and finish (satin), they’d not qualify as a contender. Here at the DARhaus, looks matter (almost) as much as sound quality. However – your visual tastes may not align with my own. Self-shot photos strip away the manufacturer’s airbrush and allow readers to observe both loudspeakers in real-world situ. Andrew Jones has specified three drivers for the U5. The KEF run with one less. Both speakers start with concentrically aligned midrange and tweeter: a 4” aluminium cone and 1” soft dome crossed over at 2.7kHz on the U5; a 5.25” aluminium magnesium cone and 1” vented aluminium dome crossed over at 2.2kHz on the LS50. 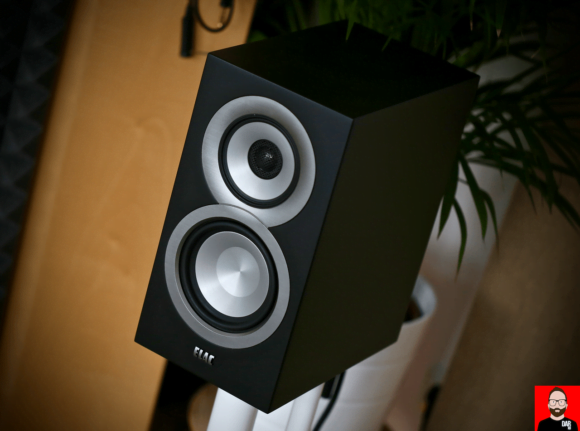 That’s where the KEF ends; its ‘midrange’ driver is also tasked with low frequency handling. On the U5 we get an additional 5.25” aluminium cone – its job is to convey musical information below 270Hz. 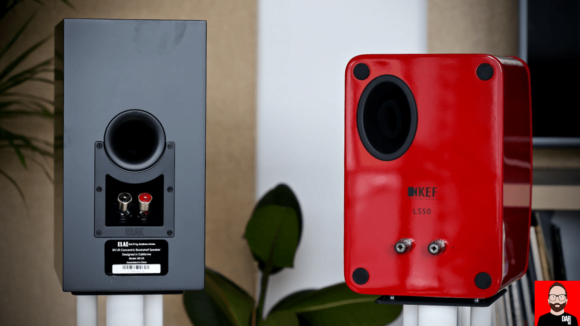 Both are bass reflex designs but the KEF’s supplied port bungs give them more flexibility when it comes to front wall proximity. Otherwise, ELAC ask us to put a sock in it. Initial impressions peg the U5 as a fast and nimble performer; quick on their feet but packing a lighter overall punch than the LS50. One might also mis-conclude that the ELAC’s bass goes deeper. That is, until a run through Shed’s The Final Experiment reveals it as instead better separated and more clearly defined than via the little red roosters. At the other end of the frequency spectrum, the ELAC shine more daylight onto Diamond Dogs’ cymbal work and searing electric guitar action, both of which shimmer and shine more overtly than with the KEFs in play. And just when you think ELAC might have KEF on the ropes, the reigning champion reminds us precisely and effortlessly on how it earned its title: a more sure-footed handling of rhythmic dexterity and dynamics, especially with electronic music where the ELAC can’t outrun their intrinsically more lightweight personality; a more muscular kick when going four-to-the-floor; greater soundstage depth from Jordan: The Comeback where Paddy McAloon’s vocal tenderness and the album’s sometimes ornate connective tissue is lent greater acoustic mass. The Field’s The Follower confirms that neither speaker is better (or worse) suited to my 7m x 6m listening room but that KEF’s greater heft and dynamic muscle means I prefer them with the outer foam ring in place. The ELAC’s ports I leave wide open. The ELAC require a few additional clockwise clicks from the PS Audio Signature Pre’s volume dial. Put a hand on the cabinet during music playback and the ELAC feel more lossy. One might easily mistake the U5’s treble exuberance for greater detail retrieval. Prolonged listening however reveals the challenger as slightly fuzzier with surface textures, particularly in the midrange. The ELAC’s tendency towards opaque warmth contrast the KEF as the more talented of the two in uncovering micro-detail and the more direct communicator. And so it goes it with acoustic guitars. The U5 wake Conor Oberst’s strum earlier and with more caffeine than do the KEF. This sees the German/American more readily expose the greater rigidity of entry-level digital (iFi Audio iONE) than the Brits but they also play more readily into the hands of the Technics/Zu/PS Audio vinyl rig’s marginally softer tonality, especially with Diamond Dogs’ more brutally grinding moments — I’m looking at you “Chant Of The Ever Circling Skeletal Family”. Which is better? Revolver or Sgt. Pepper? DSOtM or Wish You Were Here? 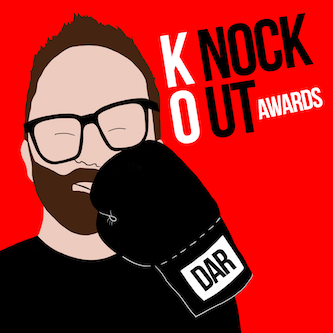 Kid A or OK Computer? The ELAC U5 or KEF’s LS50? 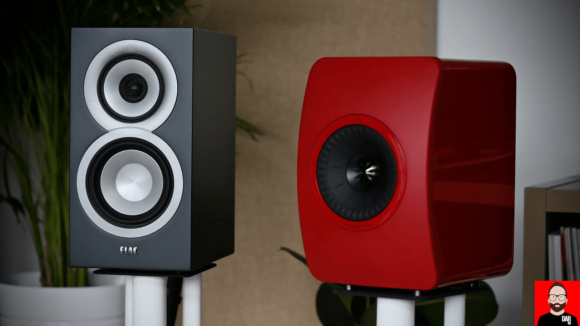 These two loudspeakers are sufficiently close in in performance – but for different reasons – that when judged as a complete package it’s almost impossible to call out a clear cut winner. Neither speaker lands a knock-out punch on its rival. In the ring then, a draw. I could easily live with either model and not miss the other. The upshot? Judged on value quotient alone, the ELAC U5 come out streets ahead. And that is one mighty achievement that deserves a KO of its own! Did ELAC provide any estimate of the release date for the actives? It seems like we’ve been waiting for at least a year. The U5 active variants are still on the ELAC roadmap, correct? I thought Andrew Jones said the actives might price in the US $800 range. Did you have the opportunity to compare them wit hclassical pieces, particularly violin in the middle/upper register and brass? (just wonderin’)? If not, might you speculate? Hey Pete. I don’t really listen to that kind of stuff. I’m a rock n roller and a techno head. 😉 Besides, classical is well covered by the majority of the audiophile press. Thanks for stepping outside the ‘audiophile orthodoxy’ with regards to your music selection. I’m sitting at my desk listening to Shed now. Being a huge PSB fan, I’m curious what PSB albums you prefer (for reviewing or otherwise). Active UniFi speakers are coming, though their release keeps getting pushed back. Look forward to comparisons of the active versions of both when they are available. I’m also very much looking forward to hearing the ELAC Adante at AXPONA this weekend ($2500 per pair for the monitors). And thanks for this direct comparison that I know many, many audiophiles are very interested in. What’s the function of the dongle hanging from the Elac backside near the speaker wire binding posts? I’ve always regarded the Elac’s as the “everyman’s” Kef R300’s since they’re both 3-way bookshelf speakers with the coaxial tweeter. Interesting to hear how close they sound with the LS50’s. I would think that for the money you could spend more on the pre-amp/amp or add a nice subwoofer and really blow away the LS50’s. Great review, thanks. Since you’re a techno head, I’m surprised you seem to do so much listening through speakers that don’t offer full range bass extension. 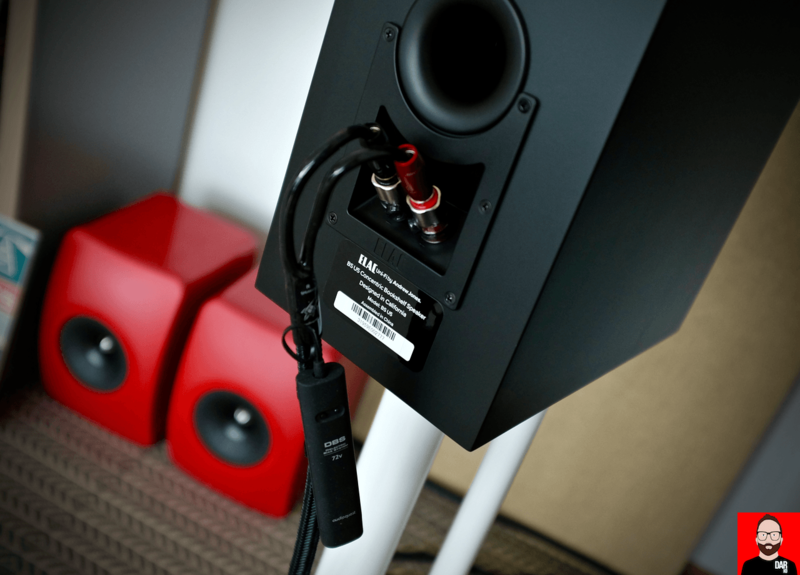 Nonetheless, if the speakers and the whole system are pumping out enjoyable sound, then great! That’s what headphones are for! Thank you for the great comparison. This makes it easier to get a perspective on the U5. Did you also compare it to the LS50 with more modest electronics? I assume that with the outstanding system you have at your disposal for your review every passive speaker’s ability can be maximized. What does it take to get the U5 to a reasonable approximation of its full potential? I know that last bit is quite subjective. At the same time if one needs to spend multiples of the speaker cost to really make it sing, one might be better off with a more expensive speaker with modest power requirements (or an active system). I did briefly try the ELAC with the Auralic Polaris but felt it was a better match with the KEF. Know that this is more a feeling than thought clarity and expanding on it would be nothing more than shots in the dark! If Diamond Dogs can be listened to at moderately high volume without cringing you should be OK with decently recorded classical violin. My question is: If I were to give you a pair free of charge which ones would you take? This takes into consideration design and finish as well as sound. The red KEFs – purely on looks. Looks are huge selling points and justify paying a hefty premium for many. If you’re willing to spend money and time decorating chances are you won’t want a pair of boring boxes with a cheapish finish dominating your living room. A salient point – some people spend a good deal of cash on wallpaper, paint, carpet, wooden flooring and furniture and vinyl wrapped speakers (for example) can undo those efforts. Hi John, thank you for doing this. Would the outcome have been the same if the speakers were positioned closer to the front wall. My listening room is also our living room, and I will have to find some speakers that sounds great when positionen close to the wall. The detailed comparison to the LS50’s was more than one could ask and a pleasure to read. What a win for ELAC/Jones and for audio lovers on a budget. Also, what a testament to KEF for releasing a speaker in 2012 that still represents one of the best values and speakers around. I absolutely get the value of comparing the Elac to a de-facto benchmark like the LS50, nevertheless the form factor similarity between the Elac and the KEF R300 is practically begging for comparison as well. Maybe it is, but I’m not at all familiar with that speaker — and it’s not at all the widely known benchmark that is the LS50. It wasn’t my original intention to write about these ELACs but there seemed to be quite a bit of reader interest (over on Instagram) so I did. The little sister to the Reference 1 is well worth a listen if you get the opportunity. If the BS U5 sound identical to the previous UB5 variant, then that really makes the UB5 an extra great value at only US $499. The same elation of value that washed over me with the US $99 Pioneer BS22 is now bringing a smile of validation for having purchased the UB5. The genius of Andrew Jones is achieving this same reaction but at 5x the Pioneer’s price. ELAC really has delivered on their initial promise/mission to bring several price/quality tiers above the Pioneers but still maintain a sense of value that surprises and delights beyond expectations. To build on your headphone comment above, do you have a general aversion to the use a subwoofer (or two) with a stereo setup for the purpose of music listening? Even with bookshelves such as these that aren’t quite full range. No aversion from me but I try to be a mindful neighbor when there are people below me. Is there much of a difference between the Slim and the boxy version? Great review and comparison I’ve wondered about for a while now. Can’t help but think how the active versions will go head-to-head though. I guess the ~$20k of PS Audio kit gives a good indication! I am enjoying my new LS50W active speakers plus a small subwoofer. Just wondering how your expensive amps plus LS50 passive compares to the LS50W active speakers? I am assuming you did not keep the LS50W? This was covered in a recent DAR article….but I won’t get into it as it’s not really on topic: ELAC. You can do more DSP fiddling and room corrections and speaker placement with the LS50W via physical controls on the speaker and the KEF control app. If that adds up to better sound maybe DAR can tell us? This review is huge. It’s a great thing when both companies can be praised. Those who want to save a little scratch can go elac. 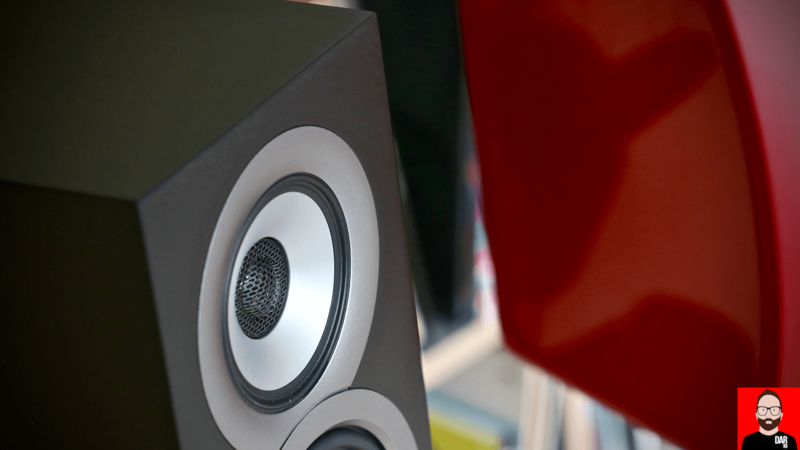 Those who need a little more eye aesthetics can choose kef. I’m sure this piece helped out a lot of people. I’m glad you did this review because if I was buying a bookshelf size speaker these are two I’d check out for my home. When I built my system a couple of years ago I was on the hunt for a quality speakers in this price range so I purchased the $1200 KEF LS50, $1000 B&W CM 1, and the $400 aperionaudio Intimus 5B. A luxury fit and finish was important to me and all three have it especially the budget priced $400 Intimus. I’ve listened to the ELACs and they sound good but if I remember correctly they were suppose to hit the market at $500? When I saw them I thought the enclosures finish was at best average and its material was almost soft so it would get dinged up pretty quick. Front face is smart but in the end it I’d be curious how the Intimus would do in a shoot out? Great review! As detailed carefully in the review, these are the “luxury finished” ELACs. missed it but that’s good news.. i saw them in white and they looked super. So I guess picking up a used pair of the chubby UB5’s for AUD650 could be considered as a stone cold bargain?